Three virtual communities, created within the LinkedIn Groups, Twitter and Facebook Pages, are open to all the lovers of ancient Rome and the Roman Civilization, including the precious heritage we received from ancient Rome which still represents the foundations of the western civilization. The primary purpose of such Roma Aeterna group and pages is to connect with others who feel the same about Roman civilization. The triumphant Roman eagle, as represented on an ancient Roman bas-relief presently kept in the atrium of Basilica SS. 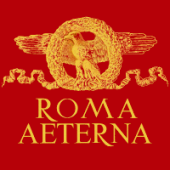 Apostoli in Rome, is reproduced on the Roma Aeterna groups logo. T-shirts, other clothing and gifts displaying our logo are available on Taberna ROMA AETERNA (more information, in Italian). To join the Roma Aeterna LinkedIn Group or to visit the Roma Aeterna Facebook Page, please click on the relevant button below. To follow @romaeterna please double-click on the Twitter button. Your LinkedIn Group membership will be approved immediately. If you do not receive approval, please send a short message to the email address shown below. Thanks to Frank (Francesco) S. Adamo for editing the tranlation !